We are Casper's premier fired arts workshop. Walk-Ins Welcome! Great classes for all ages! Host your next kids party at Pottery By You. 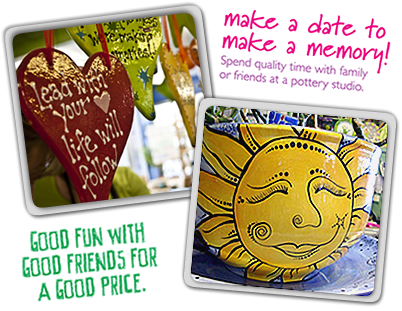 Create a great day at Pottery By You! Pottery By You – Casper’s premiere fired arts workshop offering pottery painting, glass fusing, silver clay jewelry, and mosaics. The relaxed, friendly, fun atmosphere at Pottery By You allows both “artistically challenged” and experienced artists to express their creativity.